With the Vancouver detached market cratering, home sales fell 31% in April to their lowest total since the Real Estate Board of Greater Vancouver began collecting data, all eyes are focused on the condo market. The resilient condo segment has been propelling the entire Vancouver Real Estate market forward. However, with affordability quickly eroding, and borrowing costs inching increasingly higher the condo segment may finally be beginning to crack. Sales in the city of Vancouver dropped 18% year over year for the month of April, a five year low. 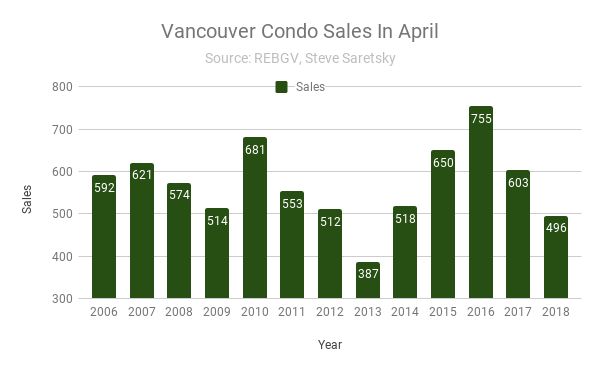 Vancouver condo sales history for the month of April. Meanwhile, price growth has been decelerating. The average and median sales price grew 12% year over year for the month of April. While this is still impressive growth it pales in comparison to the 30% annual growth homeowners have become accustomed to. Further, price growth appears to have stalled over the past four months. 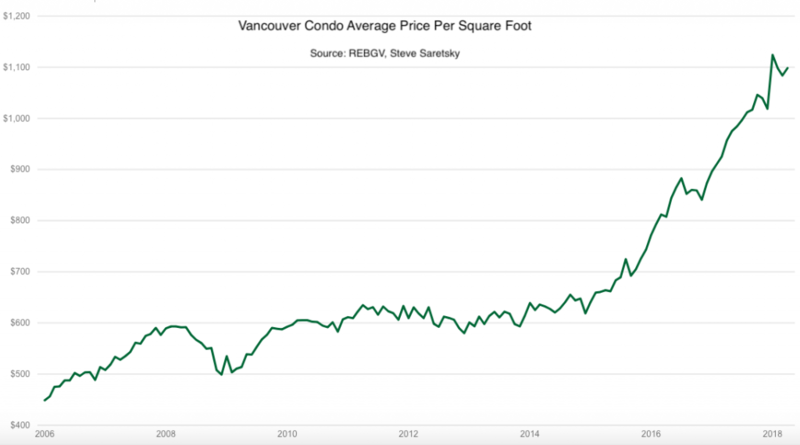 The average price per square foot now sits at $1098 in the city of Vancouver. The sales to actives ratio still sits at a relatively high 41%, suggesting there is still some upwards pressure on prices moving forward. Although, it is down 25% from the same period one year ago. New listings also climbed a whopping 34% year over year, this is partly due to new housing completions ramping up to a record high in recent months. As a result, this pushed total active inventory up 8.5%. Falling sales combined with a tightening of mortgage conditions and a staggering 42,000 housing units currently under construction, a record high, will surely alter market conditions moving forward. Per Rate Spy, following last weeks mortgage rate increases from RBC, CIBC and TD bank, it appears likely the new mortgage qualifying rate will jump to 5.34% next week. In other words, the mortgage stress test benchmark is moving higher. Reducing borrowing power by an additional 1.5%.